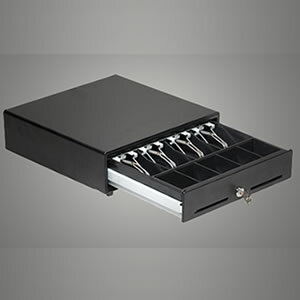 Below are listed our most popular cash drawers that are suitable for retail and restaurant use. We can also supply other types of cash drawer. 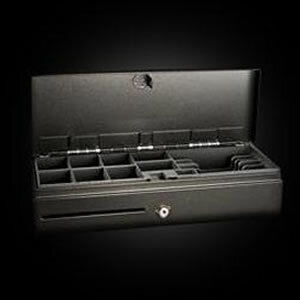 The 5E-415 is a secure cash drawer with 4 banknote compartments and eight coin sections. 24volt solenoid with RJ11 interface makes it compatible with most of our POS printers and POS terminals. Steel construction. 2 media slots. 3-position lock. 80cm interface cable. 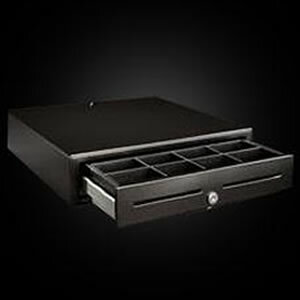 Secure and durable flip top cash drawer. The housing is fitted with strong and resistant hinges. 5 banknote compartments, 8 coin sections. 24 volt solenoid. RJ11 interface. Steel construction. 80cm interface cable. High quality compact size small drawer. 5 adjustable coin compartments and 4 note sections. Strong metal clips. 3 position keylock. RJ11 interface. Most cash drawers designed for UK currency have 4 note compartments (for £5, £10, £20 and £50 notes) and 8 coin compartments (for 1p, 2p, 5p, 10p, 20p, 50p, £1 and £2 coins). Some drawers have extra compartments for slips/cheques. Drawers vary in build quality, overall size and cash holding capacity. Check these parameters are suitable for your business requirements. The cash drawers we supply with our EPoS packages are automatically opened by the EPoS software, with a cable connection to the PC or via the receipt printer. Some cash drawers can also feature a sensor so the software can detect when the drawer is open or closed. Cash drawers with an RS232 interface are designed to connect directly to the PC. Cash drawers with an RJ interface connect via receipt printer. Manual operation cash drawers (with a push button) are also available. Although most cash drawers are provided with a key, we do not recommend using the key for constant operation as it will eventually twist and break. The key is designed to lock the drawer at the end of a shift. Cash drawers are also available in mini or micro sizes where space is confined, as well as smaller flip-top formats where the cash is accessed from above and the lid folds out. Casing colours vary between beige/white, grey and black. Some flip-top cash drawers are available in a silver coloured lid. Friday 19-April-2019 23:46 Our office is currently closed. We will be open again from 10am tomorrow.